Wow, what a hectic time it has been during the last few days! We never anticipated this level of interest in our sale - it has been totally overwhelming and we will probably be cutting orders for the next couple of weeks to clear the backlog. Thank you to all customers who have shopped so far - we do appreciate your orders. We will be sending out all items which are in stock and if something has already been sold out, then we will refund those. We will not be able to call everyone to ask for alternative choices. We are sorry in advance for any inconvenience this might cause. Tonight at 6pm we had to SUSPEND the sale until further notice in order to fulfill orders that have already been placed. Many thanks to all your lovely messages & emails of good wishes - please will you forgive Tiina, as she may not be able to respond to all messages at this busy time. If you have sent a question and expect a reply, please bear with us as we go through a huge amount of messages (600 at the latest glance) - we might not be able to respond in a while. 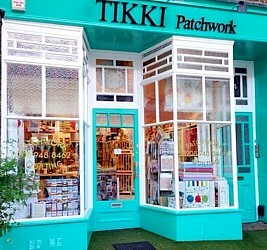 Please check at tikkilondon.com before travelling - there will be changes and we will be closed over Easter Holidays. We will also be closed on Wednesday & Thursday next week to work on already placed orders. Please stay tuned for more news - thank you.